When I was a little boy, Edeka grocery stores were everywhere. In our small village it was called ‘Pühler’. Like every Edeka shop it was named after its owner. The offerings were few and straightforward, the shops too. Everyone knew everyone. Man, do I sound old now. Most of the goods were local supply – the simplest way possible at the time. Except for the usual mass products from mass producers. They were what they always were and always will be. But they were fewer. A little later, Edeka still was everywhere but most of all Edeka it didn’t matter anymore. The goods were indistinguishable; the stores became ugly and nondescript. This couldn’t end well, but it became worse. And what came on was a perfect example in brand destruction. While on the one hand marketing the intimate knowledge of the groceries’ staff (Kinder-surprise-Girl, Butcher), someone thought it makes a lot of sense to on the other hand position a cheap food brand inside of Edeka against it: ‘Gut und Billig’ (‘Good and cheap’ sic! ). Here are ‘impressive’ brand marketing videos. A brand giving itself that name consciously surely won’t be good and cheap but ‘meh’ and poor. Even the brand logo itself does not exactly breathe and express good but only cheap and poor. Coming back to the videos, they not only show off the tacky packaging, even clients get goofed in it. As I said, Edeka went to nothingness and they completely vanished from my radar. But since a few years, strange things are happening in the Edeka universe. I did not yet research who’s got the saying there now, but someone somewhere really got a good grasp on it over there. Since years the sales people at Edeka are incredibly friendly, but not in a fake way but really authentic. The Edeka store two blocks away really became my Edeka over time. And while being huge, it still stays personal. They even know my kids. And my kids know them. (And not just because of the Lollypops). But there’s more good news. Edeka now is coming up with a strong home brand. And now the brand logo is simply Edeka itself, but now representing the company values and much more decent. The products themselves are of fine quality and provide great value for money. Now they are not cheap but reasonable. Just two small examples of great products from the new home brand: They now offer fantastic spaghetti for 99 Euro cent. The offered quality easily beats most mass products. And while they are mass products themselves, they offer some features only known to high quality pasta, which indicate some afterthought on the details. The pasta dough gets streamed through bronze nozzles. This results in a very rough surface. Thus, the pasta takes up more sauce. The rough surface gets to be a flavor enhancer. I am only used to this level of detail from my favorite pasta from Lari, made by the manufacture of the Martelli brothers, which I have written about before. Just great. Also they now offer potato chips in two flavors: Paprika and salt (see picture above). A package of each flavor is 99 Euro cent again. The packages are not too big, not too small. The crisps themselves are from perfect consistence and they taste exquisitely. They came up with that just like that. Have a taste and be surprised! On top of that they are offering freshly squeezed fruit juices of high quality and even a veggie line of foods. Lots of things are happening there! The new and old home brands are good examples on how to screw up your brand strategy or excel on it. Both experiments were made aiming on a higher margin and brand loyalty at the same time. With ‚Gut und Günstig’ they tried to compete against a German low cost grocery chain called Aldi. But on the way to low price, they gave up on quality; Quality of the product itself, the packaging etc. But that is something that the opponent itself, Aldi, would never do. They compromise on the selling environment and experience but never on the quality of the product itself. Everyone knows that, also the Edeka customer. And he does not forgive Edeka on selling quality short. Edeka did not only detract its own customers, but it certainly couldn’t win clients from the enemy. With the new home brand, though, Edeka is really empathizing with the original Edeka customer. This one will not have to side step to Aldi for price and quality. He gets it all by one stop shopping. And who knows, possibly also one or the other Aldi client will go for the upselling and follow Edeka. Until now, this sometimes was one and the same customer – top products he bought at Edeka, basic grocery like water, sugar, flour, sugar etc. at Aldi. What we can see is the super charging of the new home brand with the original values of the Edeka brand. I am absolutely certain that this not only strikes me but many other customers as a fit. And this will lead to image and economical success for the new home brand and the Edeka brand. The fit of product and marketing with the values of Edeka will lead to a sublime re-transfer of the values from the new products to the brand. Edeka will emerge with a clear positioning as a high quality but affordable family brand for groceries. But this only works because the whole Edeka system around the brand fits the bill. Nothing breaks. But there’s even more to come. Since a few weeks it is possible to pay via iPhone in Edeka markets. At Edeka! In Germany! 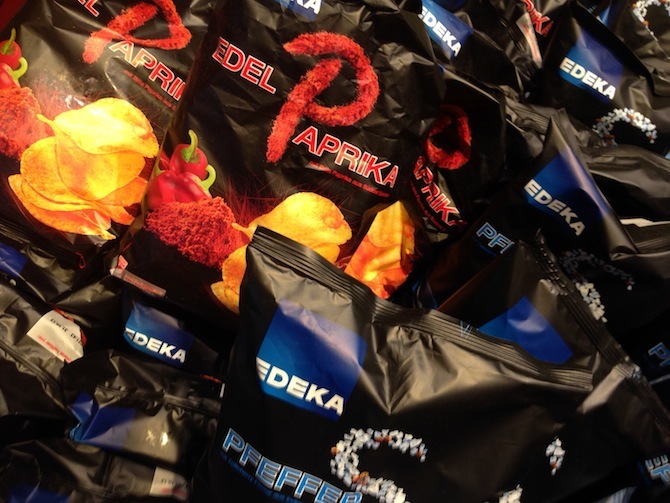 Edeka as an innovator – now that’s a crazy idea for the boy who went to ‘Pühler’ ages ago. Did you observe similar intense brand developments or experiences? Tell us! P.S. : Oh, Edeka: With fresh fruits and vegetables, you still have room for improvement! Don’t miss out on it.